I just wanted to start off by thanking you! I am so thankful for the opportunity to be here and to be able to holistically love others. Having the opportunity to focus on all of the aspects of health has really been challenging me overtime to focus on those areas of health in my own life. As many of you know, as an organization, Youth Unlimited focuses on five aspects of health; physical, emotional, intellectual, social, and spiritual. This letter is focusing more on the spiritual area of health, so this one is for all you spiritual-ish and/or churchy people. language can be difficult to understand. Those of you that know my family know I grew up regularly attending church. While attending church I noticed a disconnect between the Jesus I was reading about and the Jesus that was presented to me in church. The Jesus I was reading about sat with the most oppressed people within society and treated them with respect and love. Over time, the impact of these stories was lost on me. I forgot the value of these stories and the significance of them from reading and hearing them over and over again. A few weeks ago, I had a couple of youth approach me and ask me to read the bible with them so we began reading and journaling together. We meet once a week and read a story, and then journal our thoughts and trade journals the following week. It has been really interesting to learn from a fresh perspective and to hear the questions that come from reading these stories with fresh eyes. Journal entries can range from what is going on in life, to questions about the culture of the time compared to culture now, or a topic that we pick depending on the story we read. It is interesting to me that one story can spark so many interesting conversations and how each mind is so unique. 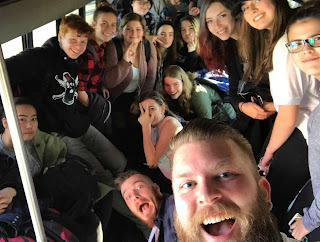 Over the last year I have also had the opportunity to go on a “church tour” where a group of us visit different churches in the lower mainland area. Each week we pick a church from a different denomination and see what it is like. Many youth that come along had never seen the inside of a church before and were just curious to see what it looked like. There were a few denominations that I had never visited before myself, so it was an interesting new experience we could share together. 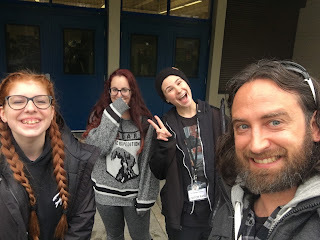 Overall, there is a lot going on and I am happy to be able to provide a pressure free space where students are able to explore new things at their own pace.